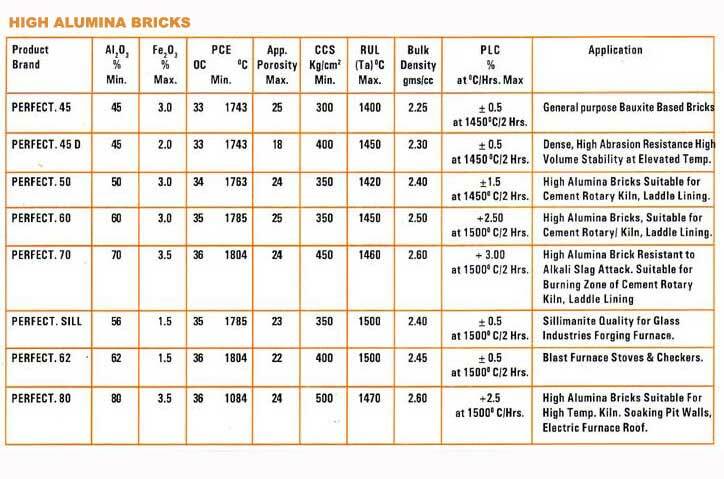 In order to meet out the requirements of neutral refractories where safe working temperature is more than 1300 degree centigrade & slag reaction is severe we are manufacturing High Alumina Bricks as per customer requirements. High Refractoriness increases with increasing alumina content. These bricks have high Mechanical strength and excellent load-bearing properties at high temperatures besides having fair to excellent resistance to spalling. These High Alumina Bricks have high resistance to corrosion by many basic slags and fluxes and fair resistance to acid slags. These High Alumina Bricks are suitable for Cement Rotary Kilns, Laddle Lining, Glass industries, Blast furnaces Stoves & Checkers, Electric Furnace Roof & Other miscellaneous industries.